Has a trusted visitor to your home ever shared your security system's disarm code with anyone? Would an employee at your business ever "lend" their code to a co-worker for convenience sake? We hope not. But if they did, how long would it take you to know? Like most security risks, user code sharing can happen for many reasons, ranging from the careless to the criminal. Whatever the user's intention, however, it's important that you stop it happening. The problem is that user code sharing can be hard to spot if you're not looking out for it. That's about to change, thanks to a new, intelligent safeguard from Alarm.com. 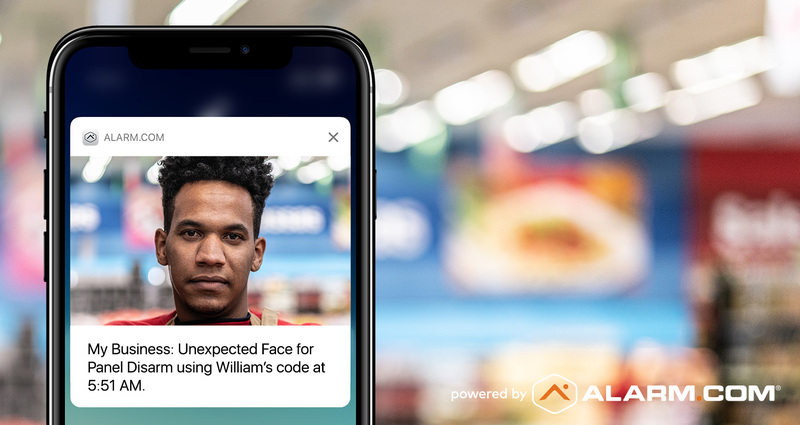 We've enhanced our Unexpected Activity Alerts with facial recognition technology that can spot an unauthorized system user, alert you immediately, and help you identify the culprit. Here's how it works. Alarm.com can now use machine learning with face recognition technology to intelligently and securely analyze "disarm" images taken by a security panel's onboard camera. After a quick setup process, Alarm.com's AI learns to recognize your system's authorized users. Once setup is complete, Alarm.com is able to detect and alert you to instances of user code sharing. Unrecognized users will trigger a timestamped Unexpected Activity Alert—complete with a snapshot of the person disarming your system—enabling you to take action. We engineered this intelligent feature to be easy for you. Once you opt in, Alarm.com will collect disarm images via the panel's camera. Using simple yes/no feedback buttons in your Alarm.com web dashboard, you'll be able to quickly "train" your system to recognize its authorized users, with as few as 10 verified images required per user. 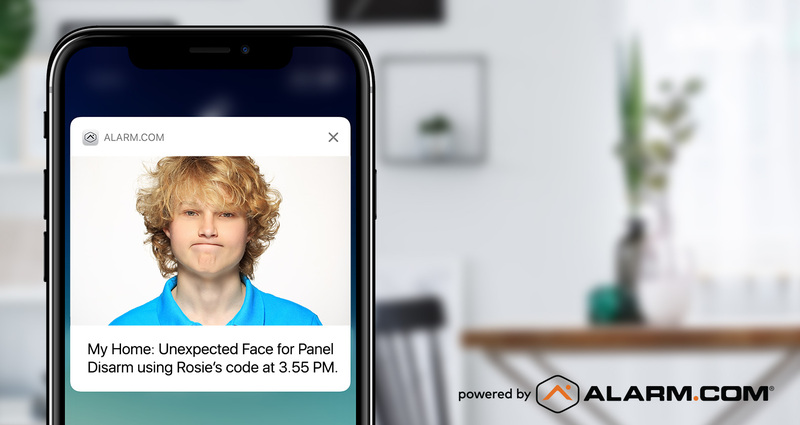 Unexpected Activity Alerts—now with face recognition technology—are just one of the proactive, intelligent safeguards developed by Alarm.com to keep your home or business safer, including Crash and Smash protection, Video Analytics and Geo-Services triggers. If you're interested in activating this feature, contact your Alarm.com service provider to learn about security panel and service plan options. Don't have Alarm.com yet? Here's everything you need to know. Image analysis data is stored on Alarm.com's secured servers and not shared with any third-party. Users can opt out at any time; opting out removes all Face Recognition data from Alarm.com's servers.